How Accurate Are the Formulas for the Osmolal Gap? The osmolal gap is most commonly used in screening for toxic alcohol ingestion. In the absence of other unmeasured solutes, sodium, glucose, and urea are the primary solutes responsible for osmolality. If a significant (usually the cutoff is > 10) difference between directly measured osmolality and the calculated serum osmolality (Sosm) is present, then the difference (the osmolal gap) may represent the presence of an unmeasured solute. The concept of the serum osmolal gap has always been tricky to grasp and even harder to explain. As sodium is the main extracellular cation, it makes sense that sodium (and the corresponding anion, either chloride or bicarbonate) makes up the lion’s share of the osmolality. But what about other cations such as calcium, potassium, or magnesium? Don’t they count at all? To make things more confusing, some countries (like the US) report [Na] in mEq/L (or mmol/L) but report BUN and glucose in mg/dL. Na is multiplied by 2 to account for its corresponding anion. Glucose and BUN need to be divided by factors to account for their corresponding molecular weights (180 and 28, respectively) to convert the mg/dL to mosm/L. The presence of an elevated osmolal gap (> 10) in this scenario raises the heart rate of any nephrologist, but let’s not forget that ethanol ingestion can contribute to the osmolal gap, too. Let’s assume this patient drank vodka to excess and had a measured ethanol level of 92 mg/dL. The correction factor to convert to mmol/L based on ethanol’s molecular weight is 4.6. If you go to a common online calculator such as MDCalc, their formula is the same as what we have demonstrated above. Previously Published Equations for Calculating Osmolarity. Note: All values are in mmol/L. For use with conventional units, multiply urea by 2.8, glucose by 18, and ethanol by 4.6. Table 1 from Lepeytre et al, AJKD © National Kidney Foundation. Additionally, several of these formulas were performed in small cohorts without external validation, and the measurements were done with outdated equipment. In a recent AJKD article, Lepeytre et al reported their findings on developing a more precise equation to compute the osmolal gap in a large cohort using modern automated equipment, and compared this new equation with previously published formulas using vigorous statistical methods. This cohort started with over 9,000 measurements where serum osmolality, sodium, potassium, urea, glucose, and ethanol were obtained simultaneously. Patients with aberrant values and subsequent missing data were excluded, leaving approximately 7,500 samples that were analyzed. There were 138 measurements in the cohort with toxic alcohol ingestion. Lepeytre et al assessed how this new formula performed statistically when compared to other formulas in predicting which of these patients would need a specific treatment such as fomepizole or dialysis. Using the coefficients stated above for urea, glucose, and ethanol, the modified equation was clearly superior to previously published formulas. Using a cutoff of an osmolal gap > 5.0 led to a 50% PPV and 99% NPV, and using an osmolal gap of > 10.0 led to 82% PPV and 96% NPV in identifying patients with toxic alcohol ingestion. Sensitivity, Specificity, and Positive and Negative Predictive Values of Equations 1, 2, 10, E, and F for Presence of Toxic Alcohols ≥ 5 mmol/L, by Osmolal Gap. Values are given as percentage (n/N). Equations are labeled with numbers to identify previously published equations (1, 2, 10) and letters to identify new equations (E, F). Table 5 from Lepeytre et al, AJKD © National Kidney Foundation. What should we make of this? Lepeytre et al note that the common formula we used for Patient A above created a high number of false-positive cases for toxic alcohols. The formula assumes that urea, glucose, and ethanol behave like ideal solutes, similar to Na. This paper (and previous publications) suggest that this may not be true; thus, the need for a modifying coefficient. What are the potential real-life clinical implications? For example, a lower false positive rate would translate into fewer empirical doses of fomepizole (or even dialysis) in patients suspected of toxic alcohol ingestion. The authors also make the important point that the presence of an elevated osmolal gap does not signify toxic alcohol ingestion if the clinical context does not fit. As with most things in medicine, the history of exposure is more important than the calculation to determine the pretest probability of toxic ingestion. This paper represents the largest osmolal gap cohort ever studied, and the subsequently derived equation outperforms those previously published. With external validation, we may see this new formula on online calculators in the near future. – Post prepared by Timothy Yau, AJKD Social Media Editor. Follow him @Maximal_Change. 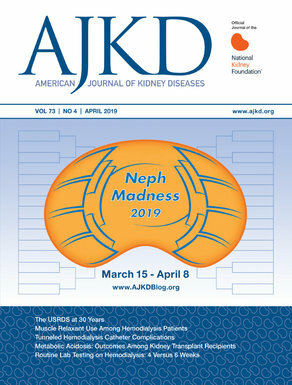 To view the Lepeytre et al article abstract or full-text (subscription required), please visit AJKD.org. 2 Comments on How Accurate Are the Formulas for the Osmolal Gap? I don’t know what cations and anions you use, but you left chloride and bicarbonate out. We measure here serum urea a neutral substance instead of BUN, although there are simple conversion formulas between urea and BUN. The best way 2 measure the osmolarity or osmolality (there are differences between the 2 terms) is the cryogenic freezing point of plasma. Of course u din`t mention plasma, but serum, and serum is defibrinated plasma. Still alcohol or CH3-CH2-OH accounts 4 osmols, but so does Chloride or Bicarbonate you left out.